Northwestern coach Joe McKeown. Photo by Stephen Carrera, Northwestern Athletics. Joe McKeown’s 28 years in coaching includes numerous program and individual achievements. Since taking the helm at Northwestern University in 2008, McKeown has guided the Wildcats to four postseason appearances, including last year’s NCAA Tournament berth. This season Northwestern has been ranked as high as 12th – the highest in program history. 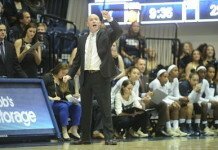 Several players have achieved honors during McKeown’s tenure, and the school credits him with changing the culture of women’s basketball there. McKeown began his coaching career at New Mexico State, where the Aggies reached the NCAA Tournament two out of his three years there. He spent the next 19 years at George Washington University, where he took the team to the NCAA Tournament 15 seasons and the the WNIT twice. In his last season there, McKeown became the 34th Division I coach to notch 500 career wins. This past summer, McKeown was the head coach for USA Basketball’s World University Games team, which won a gold medal in competition. Sue Favor: You are having quite a season so far, including being ranked higher than ever earlier this month. How does that feel? Joe McKeown: We’re young and we do a lot of crazy things on the court. We have four with a lot of experience and everyone else is young, so you never know what you’ll get, which is frightening. Sue Favor: Let’s start with the present. Before coming to Northwestern, you never had a losing season as a coach. How were you able to rebuild the program? What was your game plan? Joe McKeown: I’ve always tried to put the pieces together and not take any shortcuts. I’ve tried to do it the right way and build for the long haul, rather than looking for short-term solutions. That was my plan coming in. I was really lucky that we were able to win my second and third years, and we got to the WNIT both years. You have to win to recruit and you have to recruit to win. I give a lot of credit to players who were here, who got us going. It helped us win here – we could have finished last for 12 straight years. It gave us confidence that we could recruit nationwide. I looked at being in the Big Ten and having Chicago be the footstep. There’s a big commitment in athletics at Northwestern now that wasn’t here the past 34 years. Sue Favor: What are the signature traits of a Joe McKeown team? Joe McKeown: That we have a toughness and an awareness of what we’re doing, with a real solid basketball foundation. When the ball goes up you’ve got to play, and play hard. Being competitive – that’s our signature. We think we’re going to win every game; that’s our mentality. Sue Favor: You had such a successful run at George Washington. What made you want to leave for Northwestern? Joe McKeown: Besides career possibilities, there were some family decisions. I have a son with autism who was really struggling in school at the time. We were fighting for change in the school systems, state laws and funding. (Northwestern vice president for athletics and recreation) Jim Phillips understood my family situation, and he understood women’s basketball. I wanted to make a change and I wanted to work for someone who understood our sport. We loved where we lived and it was a hard decision…but we feel blessed. Sue Favor: What is the most significant thing coaching has taught you? Joe McKeown: The one thing I’ve learned over the years is that you’ve got to be resilient. Coaching embellishes that. It really helps to teach your players that through all those things there are always going to be obstacles. Resiliency is an underrated trait in business. Every night in the Big Ten is a dog fight. Last year won 23 the year before won 17. You’ve got to be positive but you also have to have the attitude that ‘this is what we have to do to compete.’ There is a certain culture in our sport where you have to buy in, and our players have bought in to the culture of working hard. Sue Favor: What is the key to great coaching? Joe McKeown: More than anything else, it’s enjoy what you’re doing and be true to who you are. Sometimes, coaches watch another coach and try to become that coach and then another one the next week. “We ran this offense on TV,” “they yell and scream,” “they made it to the Final Four.” There are so many great coaches out there. Be true to who you are, know your weaknesses and strengths. Let your players see who that is. Sue Favor: You began coaching college in the 1980s, in a completely different time in the life of basketball. What are the key differences in the sport and the players from then until now? Joe McKeown: Everyone who’s fought to help women’s basketball grow has fought so hard. In the 1980’s, we were driving 15 hours on Econoline; we stopped at fast food places. There was a purity to it; you did it because you loved the game. Now some of the other elements have crept in, like recruiting and social media. You think back and it was fun. I tell our players today, when we are staying in a nice hotel with a buffet: do not complain, it wasn’t always like this. I tell our players all the time to respect our game. Sue Favor: What was it like, being the head coach for the World University Games team for USA Basketball? Joe McKeown: I had a great time in Korea this past summer. These are once in a lifetime experiences for everyone. Just the challenge of trying to blend eight players to be great together in eight days is exciting. We were fortunate enough to win a gold medal. I had a great staff in (assistant coaches) Tanya Warren and Holly Warlick. There was great chemistry on our staff. Sue Favor: What is the meaning of life? Joe McKeown: It’s what you make of it. We’re very lucky to live in a country in a world where you have so many opportunities. Being a parent it’s the greatest and hardest job in the world, and as a coach it’s the same thing. Sharing who you are is the greatest thing.